Show Racism the Red Card - National Creative Arts Competition Awards Ceremony! National Creative Arts Competition Awards Ceremony! The team could not have been happier with the way the event unfolded. 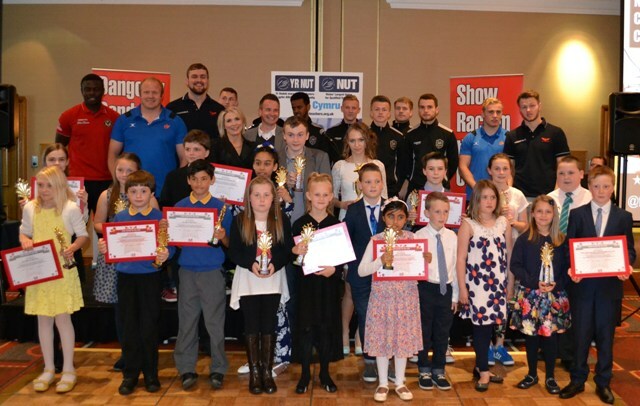 The young people were so happy with their prizes and had the opportunity to meet some fantastic sports stars too. This event is what the campaign is all about - educating the young people of Wales to become advocates and promote the message of equality and tolerance. We would like to also thank the NUT for their continued support with the competition and look forward to working with them again next year! The national Schools' Competition winners and runners-up were announced at a prestigious event held at the Marriot Hotel in Cardiff on Wednesday 6th May 2015. The competition included nine categories such as video/media, poetry and t-shirt design. Almost 100 schools took part in the competition and the campaign received the most innovative and creative entries since the competition began 8 years ago. To celebrate all the fantastic artwork received, the prize winners, their friends and family were treated to a special Oscar-style awards ceremony held in the capital city. To kick off the day's events, prize winners and their guests attended a glitzy drinks reception, which featured a circus performer and balloon modeller. The award ceremony was opened by Deputy Minister for Culture, Sport and Tourism Ken Skates AM who praised the young people for all their efforts and amazing talents on display. The Deputy Minister spoke very highly of the campaign and the important work the charity carries out in schools across Wales, urging any Local Authority not involved with the charity to support its initiatives in the future. Lunch was served and the prize winners and their guests tucked into a two course meal followed by some superb entertainment from Football Freestyler Ash Randall, who has been a long term supporter of the charity. Television presenter Lisa Rogers and Cbeebies presenter Alex Winters took to the stage to present the awards to the young people. Both presenters are great supporters and patrons of the charity and have presented the awards ceremony for the past 3 years. A full list of the winners and runners-up are listed below. All prize winners won a trophy, certificate, goody bag and some super prizes such as kindles, international football tickets, the opportunity to watch the Welsh Rugby Squad in training and Amazon vouchers. Finally, with great anticipation, the overall Winner was announced, Oliwia Dulisz from St Joseph’s Catholic and Anglican High School in Wrexham. The judges felt Oliwia’s Malala Yousafzai painting deserved to be crowned overall winner as it displayed such artistic talent and it “completely blew them away”. Among many amazing prizes Oliwia won an iPad for her school which was donated by the NUT, and the opportunity to exhibit her painting at the Oriel Gallery in Wrexham for one week. General Secretary of the NUT Christine Blower and Wrexham Council's Head of Lifelong Learning John Davies handed over Oliwia’s trophy and prize. Oliwia received a well-deserved standing ovation. The campaign would like to congratulate everyone who took part in the competition and all the teachers for encouraging their pupils to create wonderful pieces of artwork with such important messages.